Cinema Sixteen started business in 1970 in Burlington shooting 16mm films of steam railway excursions. It was an expression of the interests of Sandy Thomson, the owner. In that first decade we shot a number of films for corporate and community clients. Today the company is involved with the production of films for the parent Thomson-Gordon Group of companies as well as for outside clients. The studio was re-located in 2015 to a renovated site at the parent company’s headquarters on Mainway Ave in Burlington and another full time producer has been hired. CSI in its new location now has the support of the T-G corporate marketing group and an industrial location where product shoots can be set up in a 70,000 SF industrial setting. in a way that makes it look like the real thing. If it involves airplanes, vehicles or ships, we understand your world. The corporate group owning Cinema Sixteen is a 105 year old local business with international experience in over 80 countries. 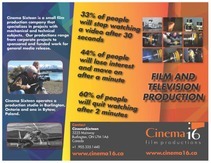 Cinema Sixteen operates a production studio in Burlington, Ontario and one in Bytow, Poland. Give us a call and let us help you bring your idea to life.